I finished my book illustrations - just need to do some final resizing before I send them off. So I took a break and snapped some quick pics of my what I've been doing in between, not in natural light but the best I could do for now. 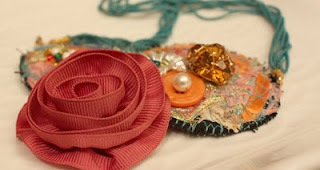 I'm so excited about these fabric jewelry pieces - they look good, even though they took ages. 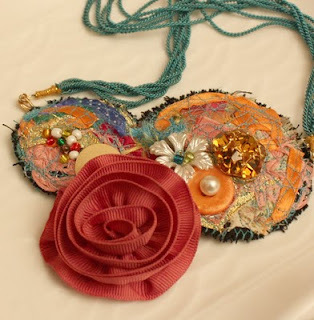 A REVERSIBLE necklace! Yes, you can flip it over and sport a new look instantly. I didn't intend it to be this way, actually, but the shiny silver-shot-with-orange backing fragment that I used looked so funky I had to develop it into its own side. 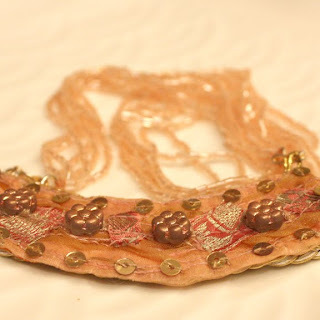 The original side is pink fabric that I covered in a layer of diaphonous gold ribbon, and voila, it became a dusty salmon that matched perfectly with the bead necklace in pale peach. 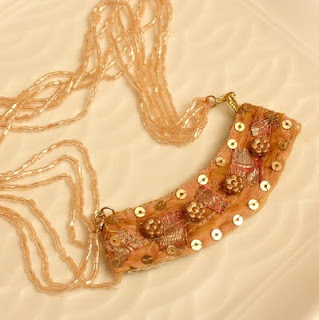 Embellished with shreds of pink brocade, golden sequins and beautiful browny-pink vintage Czech glass flowers. 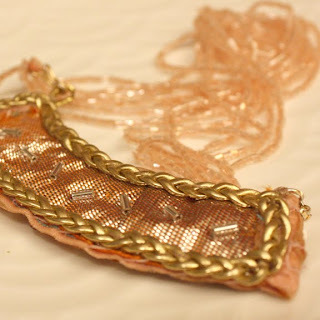 The other side is that lame-like fabric, adorned with a sprinkle of long glass tubes, and edged with a pale gold trim. Both sides look fabulous! 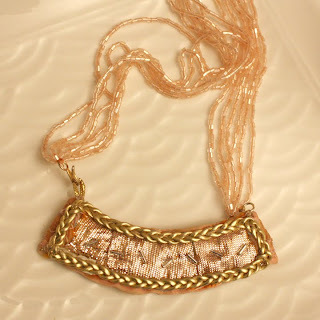 Then there's this piece that I made a while ago but could never decide upon the necklace part. 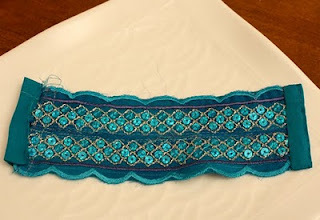 Nothing seemd to look right until I came upon this multi-strand blue chain. 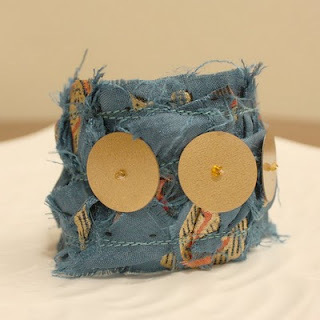 It's fabric and handmade - how cool! So finally the piece I called Celebration when I first made it, has something to celebrate! It's now whole and gorgeous. 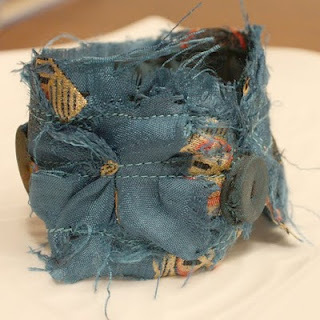 And a very boho-chic cuff in my favorite blue-green turquoise - frayed edges and large round sequins held together with a button I covered in green dupioni silk, the same fabric that lines it at the back. Finally, my work in progess. Can't you just tell it's going to be stunning! I like your cute smurf Jewelery...I only call it that because a Smurf made them (you). Love the top reversible necklace! Very artistic and pretty. Thank you, Julie! It was another of those happy accidents that sometimes happen! I am drooling over that second necklace! Gorgeous! !